What makes an Armormax custom B6 armoring standout? 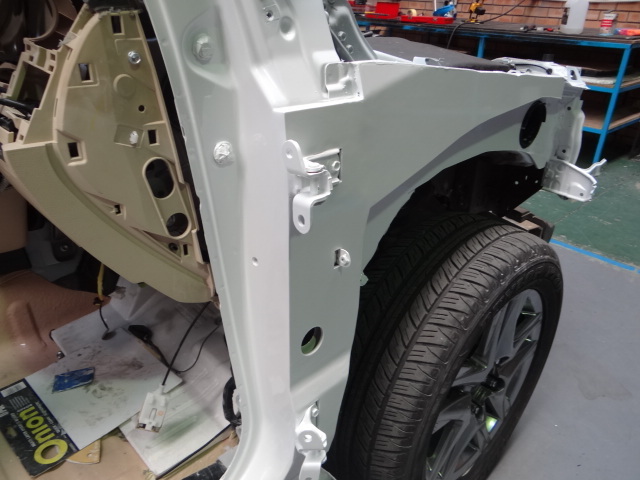 What makes Armormax custom B6 armoring stand out above our competitors? Well lets break it down, there are the changes that are visible, and then there are the changes that are hidden (unless you have access to a rather large cutting torch, and are willing to wreck your vehicle looking for them!). Combined they result in one of the best armoring conversions money can buy. First thing you will notice when looking at one of our vehicles is really very little, even when compared to an unarmored version next to it! Its really important that our vehicles blend in and don’t appear to be armored. On the visible side, its only when you start opening the doors that you will notice the leather covered overlaps. These are there to cover the gap between where the bullet resistant glass ends, and the internal armor starts. We make them as unobtrusive as possible, and use top quality leather to cover them, as they are a vital part of making sure no bullets get through during an attack! Once you open the tailgate the new armor is certainly apparent. Again covered in the best automotive leather, this section is built like this because the tailgate or boot is simply not sturdy enough to hold our armor. We build an entirely new rear armored section which provides total coverage from any bullets fired at the back of the vehicle. Although it looks pretty intimidating, the lost space is minimal. We pride ourselves on ensuring that all the safety features of the vehicle like the airbags are retained. We use as much of our synthetic lightweight armor as possible in our builds, but there are some areas where using ballistic steel is unavoidable. Where steel is used it is prepped, primed and painted to avoid any issues with rust, and to make sure that it blends cosmetically. Take a look at the two pics below. One is from a vehicle built by a competitor, and its only 18 months old! The other is from one of our builds. 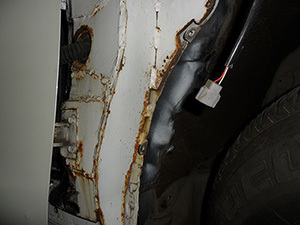 Yes, it results in a longer build time and is more expensive, but the difference that a quality finish makes to the longevity of a vehicle more than makes up for this. Another area you won’t see is the fuel tank.Here we utilize the same technology as is currently being used by the US Military in the Afghan and Iraqi military theaters. We coat the tank in a special blend of plastics. These turn the tank into a self sealing vessel, and any hole caused by shrapnel that penetrates is immediately sealed. The armor inside our vehicles is the best that we can use, and we constantly strive to remain on the cutting edge of automotive armor development. One needs to bear in mind that ammunition is constantly developing, and our armor always needs to be at least one step ahead. There are two aspects to our armor which are always under close scrutiny, How can we make it lighter, and how can we improve its efficiency? An example of how we have been able to achieve this balance is when we compare the added armor weight from one of the “Big four” vehicle manufacturers. When armoring their popular SUV they add 1197 kg’s of armor. When we armor the same vehicle we add less than 530 kg’s. Same ballistic level! Driving an armored vehicle comes with a few small compromises. When entering a boomed area with a ticket dispenser, you will need to pull forward, open the door slightly and take the ticket. ( obviously after ensuring there are no visible threats) Should a threat materialize, simply accelerate and the door will close of its own accord. This is far quicker than trying to close a window. Statistically we have had an unusually high number of attacks on our vehicles in South Africa, ( and as a result, some really happy clients!) A common question I am asked is ” but how will I know it will work?……. At the end of the day the proof of the pudding is in the eating. Take a look at the Youtube clip below.